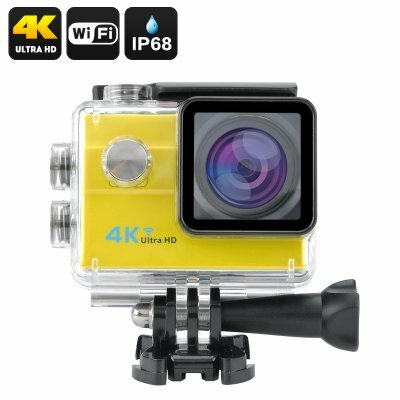 Successfully Added 4K Wi-Fi Waterproof Sports Camera - 1/4 inch Sony CMOS Sensor, 173 Degree Lens, 2 Inch LCD Display, HDMI Out (Yellow) to your Shopping Cart. This waterproof action camera comes with am impressive 4K video resolution at 25 frames per second, Wi-Fi connectivity, 16MP photo resolution, a wide degree angle, 2 inch LCD display and more. Take the 4K waterproof action camera on any of your adventures! With a miniature size, sturdy cased and water protection – it can handle anything you can while providing stunning 4K videos at 25 frames per second and snapping crystal clear 16MP pics. The 173 degree wide angle lens will ensure you get all the background scenery into the frame while the 6x digital zoom will offer an up-close look at even the smallest details. When it’s time to share your excitement with the world, you can quickly and conveniently share your pics and videos on social media or send to family and friends over Wi-Fi. If you just can’t wait to re-watch your adventures, you will be able to do that instantly on the mini 2 inch LCD screen. The camera comes with a waterproof case that lets you take it as deep as 30 metres underwater. So, if you are a big fan of water sports, the camera will easily follow you to new depths. With the 900mAh battery, you will get up to 1.5 hours of continuous filming and the cam will recharge quickly. Sturdy, portable and waterproof, it’s meant for an active lifestyle and outdoor adventures!